Six long months after the release of Exgraver, TFC Toys finally completes their incredible Hercules project with the release of Madblender. 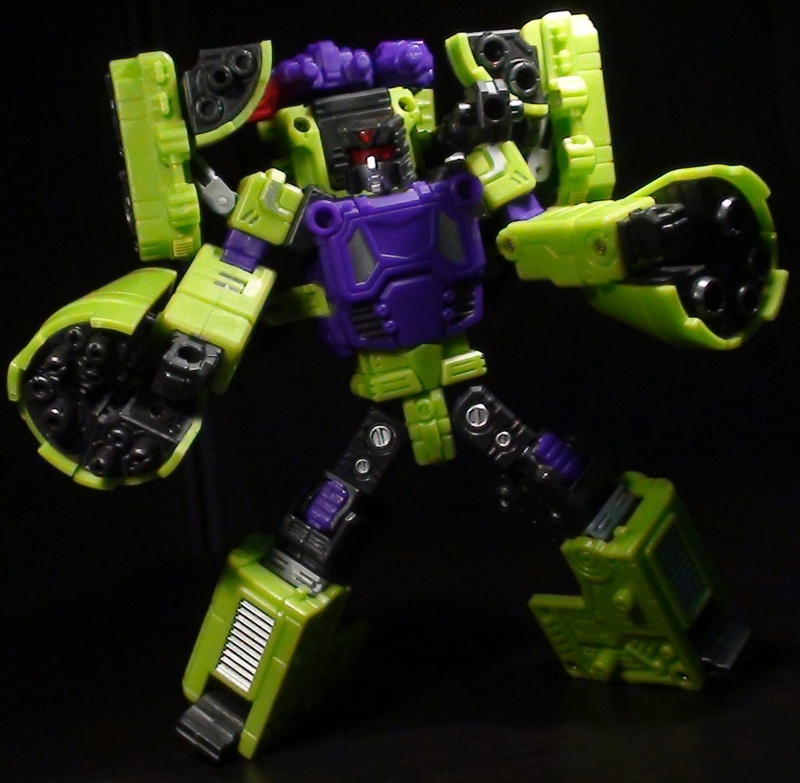 He serves as an homage to the "G1" version of the Transformers character Mixmaster and joins the rest of the figures in the series (the aforementioned Exgraver along with Dr. Crank, Heavy Labor, Neckbreaker and Structor) to form a "classics" styled, modern version of Devastator. A few hiccups aside, TFC has delivered some great modernizations of the Constructicons and while there was definitely a lot more riding on the shoulders of the first release, this final figure had a burden all his own as the end cap to the series. Was he worth the wait? Find out now! I think first and foremost I need to point out that Madblender is LOADED with weaponry and out guns all the other 'bots in this series put together! Aside from his standard handheld blasters (which he includes in purple and transparent red plastic like the other figures) his cement mixer splits into eight quarters, each containing one or two barrels/cannons. Each of these pieces can be plugged into various ports throughout Madblender's body and there's no limit to the amount of combinations you can come up with! Additionally, the center rod which the mixer barrel rotates on while Madblender is in vehichle mode doubles as a long rifle in robot mode. I wanted to show off all of the individual blaster clusters, but I've seen some really great set-ups for him that I'd definitely use when displaying him on his own. One such rig is this one from internet personality, Vangelus, on his blog. I'm a big fan of gattlin' gun style weapons, so that look is particularly appealing to me, although I haven't tried it out myself. The cement mixer barrel is designed to come together in one way, so don't be inimidated by all the parts. Basically you form half the barrel with all the male-end pieces and the other half with all the female-end pieces, making sure to alternate between the single and double-barrled sections. Pulling the barrel apart when you first receive Madblender can be a bit of a hassle as the connections are really tight. Once you've loosened them, however, it's not as bad. Madblender's handheld blasters can actually separate into two parts: the main blaster piece and the handle for the combined Hercules rifle. While MB's wielding the blasters the combined rifle's handle juts out the side (or top if you rather have there) and kind of looks like an extended magazine on a pistol. You can easily remove those handles if you prefer the blasters with a sleeker look. 'Blender's other accessory is Hercules' chest shield, or rather the center piece where Structor's wings plug into. In vehicle mode, this piece attaches to the backside of Madblender and also allows you to plug his weapons on to the sides. I don't particularly like the look with the blasters behind the mixing drum, so I did not photograph him that way. If the TFC not-Constructicons can be considered "brothers" and Neckbreaker and Exgraver considered twins, the same can be said for Madblender and Dr. Crank, who share a thinner frame thanks to their larger vehicle mode features. However, 'blender is a few points above Crank thanks to additional articulation points. He avoids the "stump-foot" syndrome by featuring some fold-up feet (created from his vehicle mode roof lamps) which are a bit short, but get the job done. Madblender moves more than Dr. Crank, but his shoulders can be a bit tricky. If you fold them down all the way, the position restricts his arm movement some. This is easily remedied by angling them at about 30 degrees. The rear wheel portions of the cement mixer mode, which end up on his shoulders, can rotate around to accomodate his drum weapons or appear as armor over his arms. When Madblender needs to get moving he converts to his cement mixer truck mode which captures the look of the original G1 toy well. It's not my favorite vehicle mode out of the six figures, but it's serviceable. Morphing him into the vehicle is an easy process, although the arms can be confusing the first time you attempt it. Similarly, the instructions aren't too clear on a key step involving Madblender's legs, specifically the knee areas. To put it as simply as possible, there are swivels above and below each knee, when you join his lower legs (the two halves form the truck's cab) you just have to rotate the knees in place. 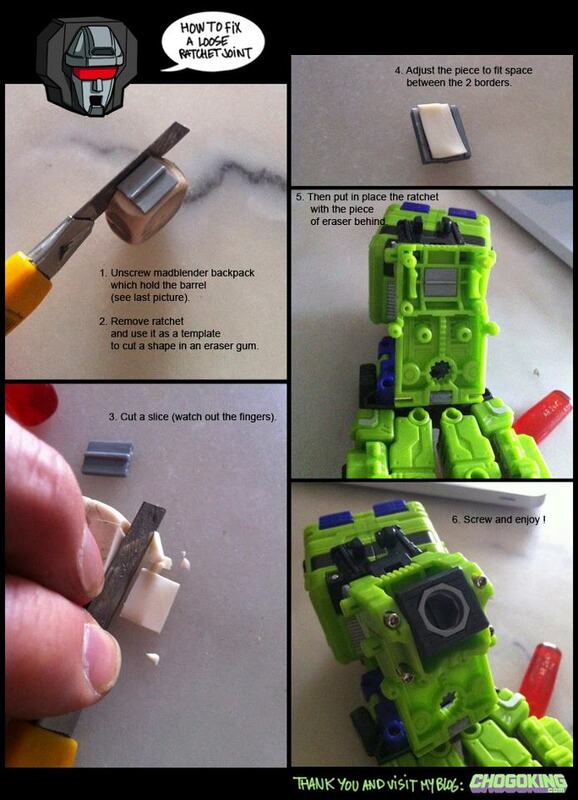 This process facilitates the legs folding inside the cab and later when he switches to combiner leg mode. Like with Neckbreaker's black chest piece, some fans aren't too happy about Madblender's all-green mixing drum, preferring an animation-accurate purple one instead, going as far as to request some sort of fix via a Repro Labels decal kit. I'm fine with it as is and the more I think about it, the more I prefer it to be all green; it keeps a nice color symmetry with Structor when Hercules is combined. 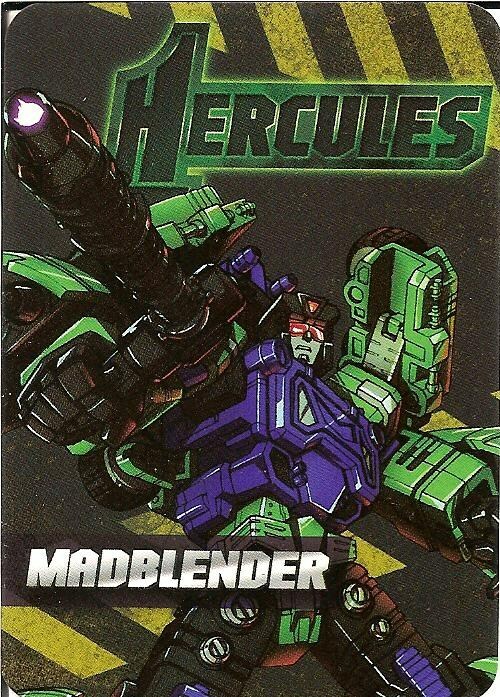 Fans of Hercules have posited that TFC will eventually release an add-on kit that may include a purple version of Madblender's mixing barrel. I wouldn't rule out purchasing that myself, it's nice to have various options for displaying the same figure, however I'd hope it has enough new items to warrant the purchase. Lastly, and arguably most importantly, Madblender converts into Hercules' left leg from the knee down. Like the rest of the team the conversion is completely self-contained, or rather you don't need to add any extra pieces to him to achieve the necessary combiner part (okay, so maybe that's not so true for Neckbreaker, but whatever). The conversion is relatively easy, probably the easiest out of the six. The first step is separating the mixing drum from the back of the vehicle. This allows you to rotate the drum vertically where it connects to the center of the truck. The mixing drum is round, but the reason for this step is so that the flat side (the other side is angled) of the piece holding it ends up over the truck cab, giving it enough clearance for the ankle joint to move side-to-side, or "rock". Once you've rotated that piece around you reconnect the backend of the mixing drum to the back post. The truck cab simply flips up, connecting to the base of the vehicle via to small tabs. The bumper sections flip down to form grips at the "toes" and two small spurs also fold down for heel stability. All in all, it's a very stable foundation for Hercules, but he ends up suffering that stump-foot syndrome I mentioned earlier. That's not at all TFC's fault, though, they just went with the classic look of Mixmaster. Unfortunately, Madblender did not arrive without a significant QC issue: his Hercules knee ratchet joint was loose and could barely support the weight of the combined behemoth without toppling over. Thankfully, this tutorial by Chogoking was posted and distributed throughout Facebook soon after Madblender's release. I literally just got around to repairing my figure a couple of hours ago and can attest to it's success in resolving the issue. It's definitely worth doing and not at all difficult to accomplish. So we finally have all six figures in-hand and there were a few issues with a few of the bots, but overall each of them turned out excellently and proved to be lots of fun on their own. Looking over the six I can't help but feel sorry for Heavy Labor (aka Long Haul). He's the only one without a fully-functional vehicle mode. All the others having working shovels and cranes, etc. while HL's dump truck mode can't dump his load. What's worse is that his arms take up most of the space in the bed. Madblender, though, is a real highlight in the set. He's lots of fun on his own and gives you so many display options it's going to be hard to choose one. The loose ratchet on the combiner knee port could have proved a catastrophic FAIL for this entire series, but luckily it required only a simple fix. Throughout this whole "Herculean" journey I feel there was a lot of uncertainty and anxiety due to the huge monetary commitment and relative unknown status of the company producing it. I'm very happy to say "glad it's over" and just sitdown and enjoy these. But we're not done, yet! Up next is my review of the fully combined Hercules (aka Devastator) and I share my thoughts on what made him worth half a grand!